Personalized Pill Holders Custom Printed in Bulk. Promotional, Inexpensive. Budget Prices for USA, Canada. We supply bulk personalized pillboxes of many models and sizes. We also supply blank (not imprinted) wholesale pillboxes at EQP (End Quantity Price): the price for the largest quantity. Free artwork design, we will Email you a proof for your approval befor production. Lowest prices in USA and Canada for wholesale personalized pillboxes. Contact us if you need a rush delivery of our pill holders. All unit prices below include your 1-color custom imprint. There is also a one-time Setup Charge of $35.00 per color. Blank pillboxes are priced at EQP (End Quantity Price): the price for the largest quantity. Typical production time is 7-10 days after art approval. Rush production is available: contact us. A. Indestructo II . . . . . . . . . . . . . . . . . . . . .
B. Pill Pouch . . . . . . . . . . . . . . . . . . . . . . . .
C. Daily Dose® . . . . . . . . . . . . . . . . . . . . .
D. Daily Pill Box . 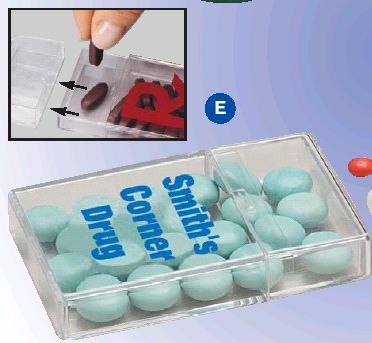 . . . . . . . . . . . . . . . . . . . .
E. Dispensing Tray Pocket Pill Case . . . . .
F. Pocket Pill Caddy . . . . . . . . . . . . . . . . .